Cimarronin is about silver, sword-fighting and slavery in 17th-century Mexico. The comic grew out of an all-star collaboration between scifi writers Neal Stephenson and Mark Teppo, science writer Charles C. Mann (1491), and artist Robert Sammelin. We've got a sumptuous preview. 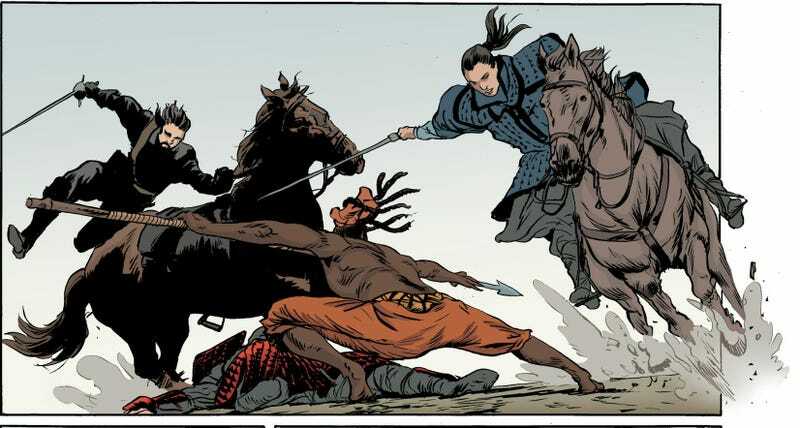 What's truly great about this detective adventure following a samurai in Mexico is that it's historically accurate — and the fights adhere to the laws of physics! The gang even got a martial arts expert, Ellis Amdur, to help them choreograph the action. He would make videos of the fight scenes, which Sammelin would use to draw the panels. The main thing is that everyone contributed to all parts ... we met/Skyped fairly often to work out basic characters, plot, themes, etc. Then Neal or I or both of us would write a brief this-happens-on-this-page-and-this-happen-on-that-page summary that I call a beat sheet, since that is what they called them when I did scripts for TV. Then Mark would take the beat sheet and—I don't know if this is even a word—panelize them, i.e., turn the rough beat sheet into panels, which often entailed substantial moving of furniture. In all of this there would be sections where we'd say, here is a fight scene on these three pages. Ellis would work out the action and film a video of exactly what would happen, which would get sent to the artist, Robert. Then I'd add historical details. For instance, in Issue 4, which we are finalizing, there's some plot business in Africa, and I put together a package of description and historic images so that the artist could have some idea what a coffle looked like (a coffle is the line of slaves fastened together and driven to the point of sale). Ellis would add historical details about Japan, which he knows real well (e.g., what a 17th-century swordfighting training ground would look like). Then we'd get the art back, and we'd realize that Robert's wonderfully expressive images had made whole swathes of dialogue redundant, so Neal would go through all of the dialogue and cut/fix it. All the way through, though, stuff was getting passed around, so it wasn't like these were hard and fast roles.